New venue for Thursday meeting; new Ascot & Windsor area meeting; possible events for next year. By Steve Foster. Phoenix Thursday meeting moves to The Poacher. As you may have seen on BlatChat or direct email to a few members we have had to move our last meeting of the month from the Phoenix to a new venue called The Poacher. The Poacher has a good sized car park, and a suitable room for us to meet in, is non-smoking / smoking and very friendly toward us as a car club. The room we will use is suitable for talks and the food menu looks good. There's even a chip menu to please Mr Webber. The Phoenix shut rather suddenly, hence the race to find a nice new venue, but we had been thinking along the lines to move anyway. The 2nd Weds meet continues at The Shoulder of Mutton of course. The free platter of chips and sausages for us each time is too good to miss out on. Jason's 7 is healthy after a Jimmy Whiting battery wiring fix and zooming around every day, of course. Den's is preparing to be towed by his newly acquired Passat estate. Nigel's has new Freestyle dampers. Brent is filling out to fit his SV properly (all those SoM chips). Currently both he and car are under construction. Peter is on at least his 2nd helping of cheese. Ray has a 7 and a 21 and a tin-top to choose from. I have just been using mine. I recently thought to take off the cage but couldn't be bothered; I feel nice and safe with all that steel around me. But life moves on and that's Phil in the picture, where he's happiest, grovelling under a 7. 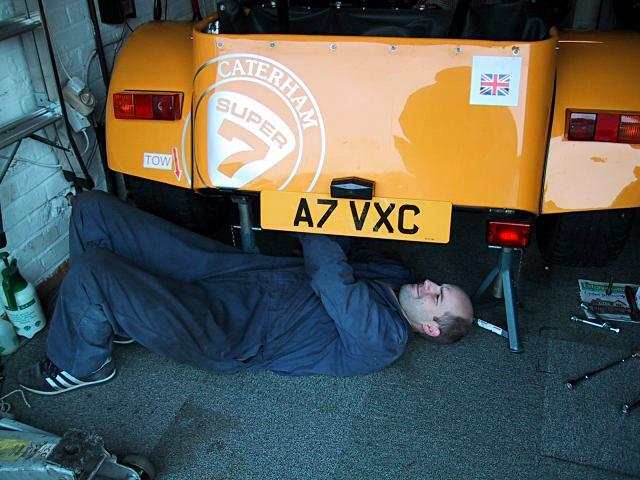 He’s just refitting my dampers, BTW. We took off the cage and put the FIA bar back on. It’s easy to get in and out of now! I can report that a Sat Nav system with some soft surrounded ear piece headphones fit very nicely inside the helmet and can be heard very nicely above the roar of the VX / TBs. I shall never loose my way again... I wonder what the poor lass would do giving directions when / if I take the 7 to the Nurburgring? I am planning several events for us next year. Early days yet but a visit to Nicholson McLaren looks on the cards. Perhaps we could get a quick 500bhp engine transplant while we’re there? How about a visit to Xtrac who make Le Mans / sportscar gearboxes? I will even ring Ron D and see if he’ll have us over for tea one evening. I’ve just got back from The Cricketers Sunday lunch meeting so time to put pen to paper or tap the keyboard... This is near Warfield, near Ascot / Bracknell. Tony Whitley set it up to cater for a daytime blat and meet once a month. Also a bit further up towards the Ascot / Windsor area to attract folk from that region. Nice pub, non-smoking area and a big smooth car park. There were only 4 of us there this time. Some car show or event on in London drew many of the regulars. Previous meetings have been very well attended. Anyway, it was very damp but not raining. Pretty much very low grip and big respect with the right foot was needed except for those "ooh it's safe here let's have some fun" moments. Had our first meeting at The Poacher. Everyone seems OK with it. Some commented on the interior décor!!! Some liked the Thunderbirds collection in the cabinet. The car park seems a bit full. How they would accommodate a normal pub-full and 30+ 7's come summer will be interesting. Anyhow, we will continue for a while and see. This page is http://www.strangely.org/7club/meetings/200411/index.html. It was first published on Saturday 4 December, 2004 and last updated on Sunday 5 December, 2004.